In case Y'all haven't figured out? I've been away from thy Keyboard recently during le 24 Heurs du Mans, having been on Sabbatical for eleven glorious sunshine filled summer Dazes! Although technically summer doesn't begin until June 20-21st - depending upon what day Summer Solstice falls upon, when sadly the days sunlight begins getting shorter; but I digress. Thus, it was funny returning home after another very enjoyable outing with Tacoma Bureau Chief Mary Ellen, Panda & Alex and "My Girls," i.e. ; Mad Molly and Thy Pixolator, my constant FURR-rocious lap Hoonds; Hooah! as Pixie's even come to growlin' at Mwah when trying to remove her from said lap; Aye Karumba! Although actually having departed for an evening's Symphonic rhapsody at the Seattle Center prior to departing from our Tacoma lair, as several years ago Mary Ellen turned me on to the most mesmerizing Opera known simply as Carmina Barana, having loaned me a CD of it performed by the London Symphony Orchestra, Me Thinks? Having forever since wanting to hear I-T live, I got "the Call" from Mary Ellen informing me my wish had come true, as this epic Opera would be performed at McCaw Hall to which I immediately purchased tickets for the second Friday evening's performance. Even better yet, our Classical Music radio station KING FM would be broadcasting the opening night's performance in its entirety, with an added first part half hour's Concerto DSCH, for which Mary Ellen alerted Mwah to just hours prior to thee curtain going up at 7:30PM Friday, May 29th! As the following review seems pretty tepid at best, for which I hadn't gone to see the Ballerina's, especially from our fifth floor 'Uber upper balcony seats - instead simply marveling over the music wafting skywards. And perhaps Y'all are somewhat familiar with what arguably is its most famous tune, for which has been used in countless movies, television programs and even radio commercials! As McCaw Hall is named in honour of the Brothers McCaw's mother Marion, when Bruce, Craig, John and Keith donated $20m to Seattle Opera House's major renovation in the early 2000's. As perhaps the name McCaw is only familiar to Mwah? Along with Diehard IndyCar race aficionados, eh? After all, Bruce was the major force behind PacWest Racing, our local racing team between 1993-2002 - featuring such drivers as Danny Sullivan, Mark Blundell, Mauricio Gugelmin and Scott Dixon to name a few. Having taken the elevator to the fifth floor to our balcony seats in the 2,963 capacity seating facility, where the acoustics are fantastic! Pondering the name McCaw I found myself struggling to quit thinking about PacWest Racing during the beginning of Concerto DSCH', since after all I was there simply for Carmina Barana. Thus, I recalled being present at the team's and Blundell's inaugural IndyCar win at Portland Int'l Raceway and find it fitting that the team capped their '97 win streak with "B-I-G' MO" (Gugelmin) taking his lone IndyCar win at Vancouver, BC, whilst I cannot recall Blundell's other two victories that year, before I told myself to quit thinking about racing during the Opera! As I suppose it's somewhat symbiotic, since when I say I'm going to Florence, I often hear how I hadn't mentioned going to Italy; Hya! And thus taking in an Opera seems only natural before leaving for the "Other Florence." Not to mention Karmically having had 'CARPETS read me that 'Ol Gordie's (Gordon Johncock) 1973 Indianapolis 500 winning mount was owned by Craig & Susan McCaw when visiting the IMS Hall of Fame museo this past Memorial Day. Alas, the four of us piled into the "Abominable Snowman" or great white Uhm? As I'll stick with the Snowman tag since after all there's another such creature known as Sasquatch up here; Hooah! And made our way very leisurely down the coast sans "Super Slab," aka Interstate (I-5) Highway, spending the first evening somewheres' in Chehalis? At of all places an Indian Casino! Fortunately Mary Ellen insisted we stop at Oswald West on our way south, where we took a very quick 'Walkabout to the beach, since we'd make the mistake of trying to stop there on our return on a sunny Saturday afternoon when there was absolutely NO room for our nearly 30-foot monstrosity - as Mary Ellen proclaimed there must be at least 100-cars parked there! As driving The Beast thru Cannon Beach must have been even more unnerving for Mary Ellen since it was Chock-o-Block full of tourists, vehicles, etc as we vainly searched for Beach access that your visually impaired 'Vurd Botcherer could easily navigate. As it was funny that while spending three nights in Honeyman State Park, Alex's favourite due to its magnificent Sand Dunes was cold due to the combinations of overly strong winds, cool ocean breeze and our campsite being primarily in the shade; Crikeys! As we were primarily there to attend Colin's GED Graduation ceremony, for which his teacher Leonora really believes in her students, cares for them and thinks they should experience the emotions of graduating, as Colin's Lane Community College's Florence campus class of 2015 had four students participating in said ceremony. And the day prior to actually leaving for this adventure after having checked out the Audiobooks, as we stood in the parking lot having a Chinwag' with some locals whilst trying to figure out a nearby street's name, was it VAssalt, Visher or Vassar? I quickly blustered out I know a Jimmy Vasser! As Mary Ellen snorted I'm always anglin' to work motor racing into a conversation; Hooah! And I did get two other wishes granted, the first being to ride "Little Toot;" Err the insanely small nine car Ferryboat across the Columbia River, for which we learned had been upgraded to a new somewhat larger Ferryboat having cost $4.5m from our amiable ticket taker. On our way home, as Mary Ellen managed to drive our entire 802 miles odyssey without ever limping onto I-5, preferring to travel the two lane Twisty 'Ash-fault instead. For which I'm certain the many cars and trucks behind us on Highway 101 dually appreciated, right? We diverted to Fort Stevens. Although I'd taken a veritable treasure trove 'O CD Audiobooks to listen to, I never got around to actually listening to any, as Fort Stevens came to my Attenzione courtesy of one of the many Clive Cussler novels I've enjoyed over the years, having discovered it in Black Wind. And further chronicling in another Tomaso Files tome, after having only gotten halfway thru the book previously - I enthused how the Black Wind novel taught me who Ryan Brisco's NTT Data sponsor was. As Fort Stevens was within easy reach of our destination Warrenton, which hey Oregon! If you're gonna stick with your ridiculous law over having somebody else Fillerup' our petrol tanks, then for DAMN sure, put our gas cap back upon our vehicle! As Mary Ellen's now the proud owner of a spare gas cap since our original was left off when filling The Beast's 25-gallon gas tank on our way south. And when crossing over the Columbia via the Astoria bridge, Mary Ellen noted for the second time in a week mud could be seen along the river's banks which I've never heard of before, while one of my favourite local grocery store checkers informed me he'd cut his fishing trip short because the river lacked any decent amount of water! While Cheryl, my Awesome shopping assistant told me ditto for Lake Cochise, all of this whilst William Shatner wobbles on 'bout us sending California our water; Oh Never Mind! 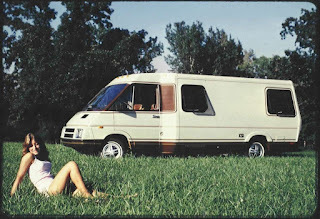 Having spent another very enjoyable night's respite in one of our favourite 'lil camping spots, as I settled down for my evening's slumber in Bay City, I pondered what was happening at Circuit de la Sarthe and surely the competitors were having a much more grueling time than I snuggled warmly in "The Beast!" After having arrived somewheres' around Midnight, the next morning Claudio' of Austin fame inquired what races were going on? To which I replied they don't race on weekdays. Hey Dude, its Sunday! Oh Crap, I guess that the 24 Heurs du Mans is over by now, totally oblivious to the wonderful outcome of the day's IndyCar race in Toronto. Will NicoHulkenberg's Le Mans win affect his Formula 1 prospects?